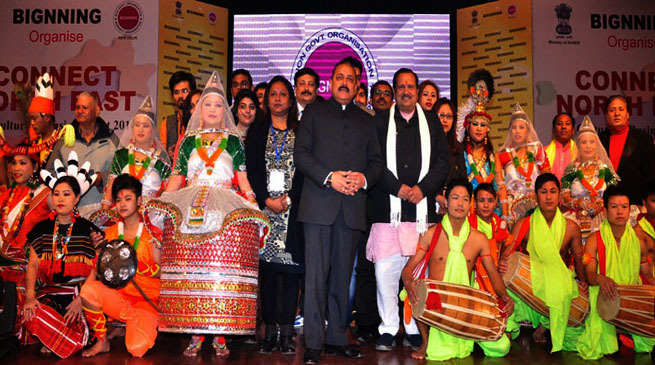 The Union Minister of State, Development of North Eastern Region (DoNER), Dr Jitendra Singh said that Northeast culture has enriched India’s diversity and north east is a distinct example of diversity in various forms. The invaluable cultural exclusiveness and variety needs to be showcased, he said. He was speaking at a cultural programme depicting various traditional dance and ballet presentations from different States of Northeast like Nagaland and Manipur. The programme was presented by a group of Northeast artists on the eve of Republic Day and was also attended by noted thinker and ideologue Shri Indresh Kumar. Dr Jitendra Singh said, while much is talked about bringing Northeast closer to the rest of India, very little is known in the rest of India that there is much more to learn from Northeast. For example, he said, while Northeast is distinct because of its firm cultural roots, at the same time, it is also far ahead of several other parts of the country in the fields of literacy and economy. Citing instances, he noted that Mizoram had a literacy rate as high as 92% which was next only to the State of Kerala and Manipur had a growth rate as high as over 22% which was very remarkable in the context of the overall growth rate of the country. Dr Jitendra Singh said that this is an opportunity for the people of Northeast, particularly the youth, to come forward and to show the way not only to their peers in the region, but also to young Indians across the country. Referring to Prime Minister Shri Narendra Modi’s recently launched “Start-up India” plan, he said, the youth in Northeast can start-up in the field of organic farming and can thus show the way not only in the region, but also to the rest of the country.